While smartphones are available with Windows, the most popular OS for handheld devices most people use Android. It implies that we have to play two OS: Windows on our PC/laptop, something quite different on our other devices. Many people use data sharing between these devices. They do it by synchronizing in the cloud or transferring documents using Bluetooth or USB. What if you have to share software? In case you wish to use apps that you enjoy on your devices and you want to use them on your laptop, what will you do? On the contrary, if you have a package that’s useful on your desktop, using it on your Android tablet can be something great. But is it all possible? Fortunately it is. You can make use of your android apps on a Windows PC or laptop with the help of Android emulator app. BlueStacks can be good but it's not completely intuitive when you use it. 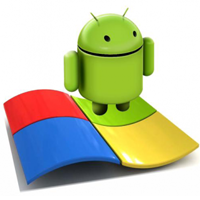 you can also consider YouWave and KoPlayer for emulating Android in Windows. The BlueStacks App Player is free and enables you to run Android apps on your Windows machine. However, remember that it is not a full Android emulator which will help you enjoy a complete Android experience. To use BlueStacks you need to sign-in with a Google account. In case you don’t have it already sign up for one. BlueStacks focuses on playing Android games under Windows. That means when you run BlueStacks the major portion of the screen will be taken up with game suggestions. But unlike some similar packages, it includes Google Play. That is why you can search for and install apps just as with a true Android device. We had to face some issues like when we ran the Wind-Up Knight we encountered texture issues implying we couldn't see our game properly. In addition, some apps, the screen looked very pixelated while it is perhaps unavoidable on a large computer screen while using an app written for a small low-resolution screen. Also, on a non-touchscreen PC, zooming with apps that anticipate pinch- and reverse-pinch gestures can be an issue. BlueStacks suggest that Crtl + and Ctrl - should work. However, it didn’t and it seems that it’s possibly app-dependent. YouWave is a solution that can offer you a full Android emulation on your PC. No matter the issue of full Android compatibility is an asset than the app player approach of BlueStacks, we don’t really know. YouWave makes use of Oracle VM VirtualBox as the emulation engine. However, in case you have VirtualBox already installed you have to uninstall it prior to installing YouWave. There are couple of editions, the Free Edition running on Android 4.0.4 (ICS) at the moment, and the Premium Edition that runs on 5.1.1 (Lollipop) and costs $29.99, for which you will have to apply the Activation key within 10 days of purchase. YouWave is much like BlueStacks. They are quite similar the issues of pixilation and zooming. While BlueStacks seems like a fully-working Android experience, YouWave will remind you more of an Android Tablet screen on our Windows machine. In any case, they both offer a good Android experience. However, if you want to opt for the YouWave way remember to make good use of the free version before making up your mind if to buy it. Some other Android emulators are also available that are particularly designed to run Android games, like KoPlayer meant for those looking to play their favorite Android games on PC. But, you must have a graphics card that supports OpenGL 2.0 to run the program. To run Windows on an Android device it is important to have some virtualisation software and a good internet connection, and to keep your system running at home. Microsoft's Remote Desktop app can do the work with some versions of Windows. We will be able to use CrossOver with Android devices running an x86 processor soon as well. Solutions for using Windows apps on an Android device include accessing a Windows computer r a virtual PC through the cloud rather than running the software on your device directly. Though this is surely a reflection on the more limited resources accessible on most Android devices, it’s a practical solution. The way is to connect to your home PC with the help of the Microsoft Remote Desktop app on your Android phone or tablet. While you don’t have to install any software on your computer, it will work just if that PC is running some editions of Windows. For Windows 8 in particular you require Enterprise or Pro and for Windows 7 it’s limited to Professional, Enterprise or Ultimate. Considering that most home users have basic or Home editions, this is one is not a choice. The option is not natively available for Windows 10 users having no support to run the Remote Desktop Client on Android. Next, for this to function your home PC must be switched on while you’re not at your place. Lastly, while you can run the Remote Desktop app on any Android device, if you’re going to be using it to any great extent, a tablet would be a better option compared to a smartphone. Trying to navigate a Windows desktop on a small smartphone screen will call for much zooming and panning after all. We'll be able to run Windows programs without any problems through CrossOver by codeweavers soon. While this choice will be limited to some Android devices and potentially be buggy depending on what will be running. However, the option is worth considering always. A growing number of platforms have been developed that allow you to run both Windows and Android natively. Industry experts are not sure if these all-in-one machines will make a reality but it’s a possibly exciting solution to the Windows-Android clash. Laptops, PCs and hybrid laptop-tablets that run Android and Windows are worth tracking down if it attracts. Devices such as these are popular in China. You can search online to explore them.